The French were just never able sell their cars in the US. In some cases it was easy to see why... Citroens were engineering marvels, but looked liked something out of a Sci-Fi film. They scared the hell out of most Americans, especially American mechanics. Renaults looked great on paper, but unfortunately were huge letdowns on asphalt. Renault seemed to save money by letting the consumer do the R&D work for them. (It seemed like any Renault model sold in the US was always "right" just about the time it was discontinued.) Peugeot, on the other hand, made some decent, nice looking, fairly reliable cars, but could never figure out how to get the US car buyers interested in them. The 505 was introduced to the US in 1980. Designed by Pinninfarina, the car had a classy, if somewhat unexciting look to it. For the most part this was the only Peugeot sold in the US throughout the 1980s (Peugeot did offer the larger 604 for awhile, but it found very few homes in the US. The 504 station wagon was still imported to the US in the early eighties, until the introduction of the 505 wagon) . Peugeot made the most of the 505 by offering a dizzying array of models and drivetrain choices, including the "GL", "S", "GLS", "STI", "DL", "Liberte", "STX", "Turbo", "GLX", "SW8" and "Turbo S". There were a few "special editions", too. Engines included a 2.0 liter 4, a 2.3 diesel and turbodiesel, a 2.2 turbodiesel, a 2.2 4, a 2.2 turbo 4, and a 2.5 V6. There may have been a few others I missed. Most of these powertrains were available with 5 speed transmissions, all were available with automatics. Got all that? The PRV V6 is a really good engine. It's a bit noisy, but durable. (A note here; this engine, when fitted to a Volvo, had a reputation for eating cams. This problem didn't seem to occur in the Peugeot) The Peugeot suspension is better than the suspensions found in many modern cars. The interior is extremely comfortable and well laid out. Early 505s rusted badly. Later ones are much better, but still check around the rear wheel wells and door bottoms. It's been my experience that as these cars get older the electrical connections start to corrode which cause some intermittent problems. Tracking down the problem can be a pain, but the repair is easy. Getting parts for Peugeots is not as tough as it could be as there are some websites dedicated to the cars. One of my STXs I pulled from a junkyard. (It had been hit in the rear and needed a bumper and tail lights.) It had 180,000 miles on it. I contacted the previous owner who told me the engine had never been apart. I never did any engine work to it and sold it locally with over 225,000 miles on it. The last I knew it had over 265,000 miles on it and the new owner had done no work to it either. The car for sale on eBay is located in Florida and appears to be in good condition.The seller states that it's losing power steering fluid and the sunroof doesn't work, but the car is rust free and straight. There is some weird graphic on the hood (I can't figure out what it is), the clearcoat is fading and the divers seat may need attention, but all in all this is a well preserved 21 year old car. If I had a bigger driveway, I'd be bidding on this car. Click here to find the Peugeot Club Launch Point. This might very well be the most frustrating website I've ever encountered. But, if you have the time, you can find some interesting info in between all the dead links and redirects. 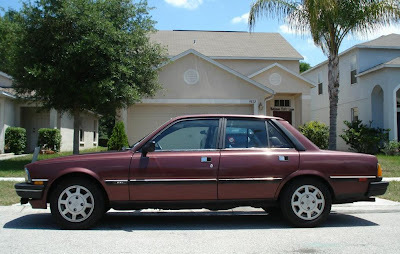 Click here to find 505Turbo.com - As you probably figured out by the name, it's main focus is the 505 Turbo, but it has some good general 505 info, too. Of course by the end of the 80's the 505 had become terribly dated and Peugeot tried the 405 as a replacement however, that proved to be the death knell for Peugeot in the US. I just think that most buyers thought it was a 'less' of a car than the 505...and they really did need to sell more than one car model in general.